Living in London I had never really looked for Greek food. I feel one needs to embrace everything each city has to offer. In a globalised world where everything is available everywhere, I believe it is nice to try and eat locally. Not that I don’t break that rule myself. 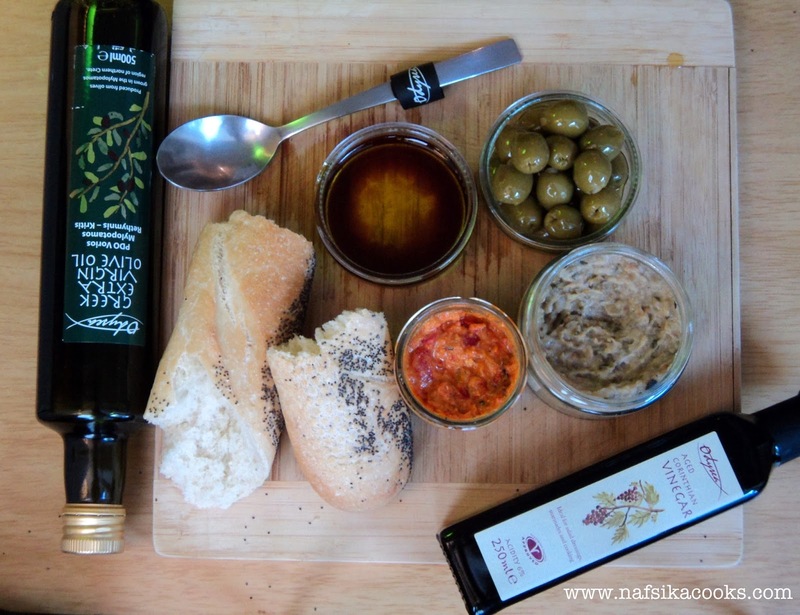 Truth be told, every time I go to Greece I bring back some olive oil, vinegar, honey and maybe a jar of olives. Recently, when dropping off my suitcase at Athens Airport on my way back to London, I was asked if I was carrying olive oil or honey. It was then that I realised that I was apparently, not only the only person who brings foodstuffs from Greece. Rather, as the kind lady from Aegean airlines informed me, it is me and pretty much everyone else. But having never actually shopped for Greek food in London, my interest was piqued when I was offered a basket of Greek food, sold in London by Odysea. Greek food in London? Would this be something worth looking for? I was very keen to try it. Although at times the more commercial manifestations of food can be slightly disappointing, lately there have been some amazing initiatives in bringing the pure flavours of Greece to the urban table. The word meze on the jars immediately made me think of sandy beaches and shared plates of food, families and friends gathered around the table, sharing food and laughing under the sun. You see, for us in Greece food is not only a way to get the nutrients we need for our body; it is much more than that. Food is what brings us together, it is a shared experience. In villages and small towns food is prepared in a ceremonial way which brings neighbours together; foods are baked in the village oven; large families gather around the table on Sundays for lunch; friends share grilled octopus and other delicious treats by the beach; big weddings in which the entire town is invited and special food is prepared; bringing sweets to the office on one’s nameday; the strong link between food and hospitality (the Greek filoxenia) where every stranger is a guest. All acts of eating in Greece are linked with sharing. Food ceases to be an individual act and creates strong bonds amongst families, neighbours, friends, strangers. It is one of the elements which hold society together. I decide to prepare a platter for my friends with all these goodies. As I am waiting for them to arrive, I first open the red pepper feta meze, which needs a bit of stirring (either that or I am looking for an excuse to get a taste before starting to prepare my platter). A few minutes later, having licked the spoon more than once I realise that this is a very, very tasty dip. I was expecting something salty because feta is usually a very salty cheese. But the red pepper (which I feel is burned and peeled) gives the dip a unique sweetness which balances the intensity of the feta cheese, bringing the whole dip more to the sweet side. Its bright orange colour with intervals of white and red really reflects the brightness of the dip. Next I open the aubergine paste. It is not smooth as I’d expect. I dig a fork in, forgetting about the platter and the crusty bread that is sitting next to me. Creamy, with crunchy intervals of aubergine pieces, smoky with a hint of acidity, subtle hints of flavours of garlic and parsley, the smokiness of the aubergine is fantastic. 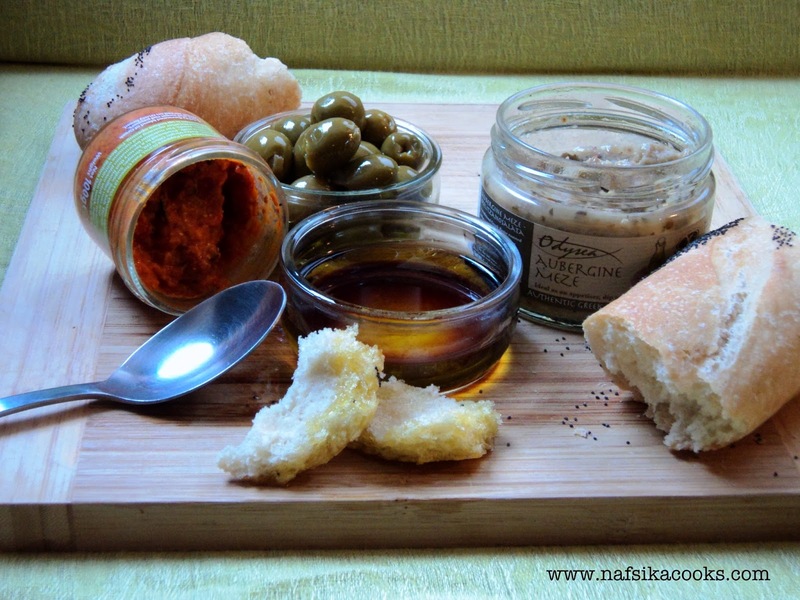 Rough yet soft, smoky and bold this dip really combines opposing elements that come together in an intense way that makes you taste it again and again before you realise that there is some crusty bread next to you waiting to be used. My personal favourite. I also have a jar of lemon-stuffed green olives. I have tasted green olives stuffed with peppers or almonds, but never with lemon, what an inspiring combination! I put one in my mouth, not feeling the lemon only after a few seconds later when it appears. My mind goes immediately to a cool summer night, a chilled glass of white wine and a bowl of these delicious olives, a few pieces of crusty bread and a bowl of olive oil with vinegar. 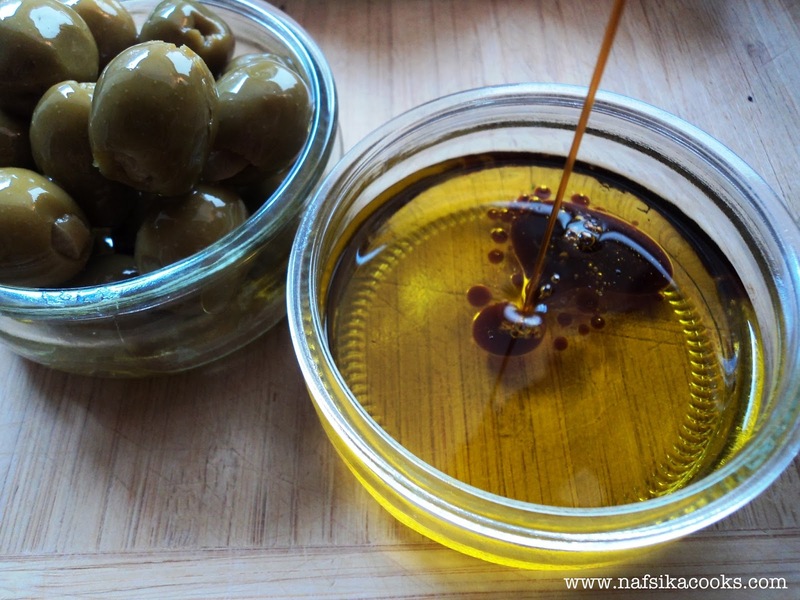 I pour some olive oil and vinegar into a glass bowl. Sometimes the simplest things in food can bring you enormous pleasure. And often, ideas come from just looking at an ingredient. Chicken stuffed with lemony olives cooked in a lemon sauce, a flaky tart with the aubergine paste and goat cheese; a pasta salad with the red pepper-feta spread and olive oil ...Or maybe Green olives stuffed with orange for the more adventurous ones? I feel full from having tasted everything so extensively - I will call it research for my blog post if anyone asks. Initially I had in mind to prepare mini bruschettas, slices of the bread to which I will spread the dips but then it hit me. This is Greek food and as such it needs to be eaten in a proper Greek manner. Dips and bowls of olive oil scattered around the table, whole loaves of crusty bread for everyone to share and a bottle of chilled white wine. With such amazing food I am feeling very proud to be Greek. Next time I will cook that chicken with lemon-stuffed olives; I think it will be the perfect summer dinner. Shared with friends of course! Meat, bees, offal and ice cream!